Carey Clarke was born 1936 in Donegal. He attended the National College of Art 1954 – 59, Salzburg Summer Academy of Fine Art, 1969 and Summer course Slade School of Fine Art, University College, London, 1991. He taught at the National College of Art and Design from 1959 to 1995. 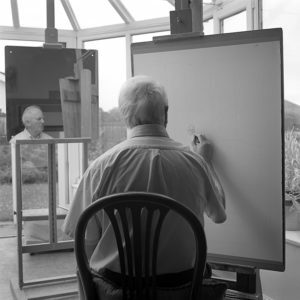 He was elected Member of the Royal Hibernian Academy in 1980 and was President of the RHA from 1992 to 1995. Clarke’s first solo exhibition took place in the Molesworth Gallery, Dublin, 1966. Haverty Trust Purchase for Ulster Museum.